Myth: Fat Will Come Back Somewhere Else After Lipo. Myth: Results of Liposuction Aren’t Permanent. The results of liposuction are intended to be permanent. What this means is that the fat cells that are removed will not reappear. However if you gain weight in the future, fat can accumulate in surrounding areas and the remaining fat cells in your treatment area can become larger. While the fat cells are permanently gone, you can once again find yourself with unwanted fat if you gain weight, so your healthy habits will determine whether you maintain your liposuction results. Myth: Liposuction Is a Reasonable Treatment for Obesity. Liposuction is not a good treatment for obesity. Liposuction is not effective, even as a last resort, for people who are unable to lose weight by dieting and exercise. 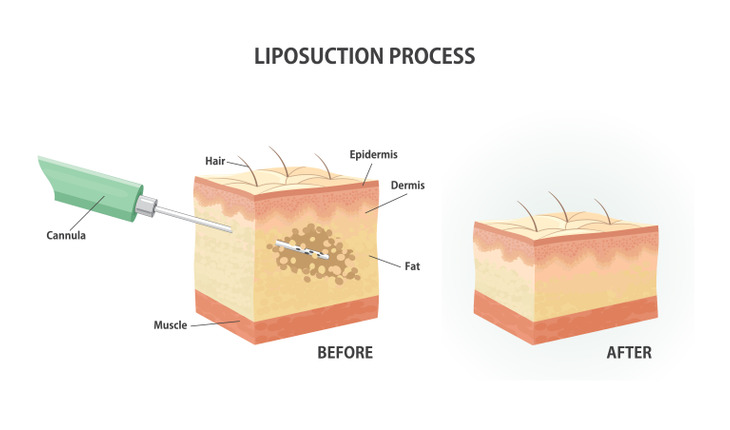 Myth: Non-Surgical Alternatives to Liposuction Are Just as Good. Myth: I Will Lose Weight from Liposuction. Liposuction actually has little effect on the number on your scale. It is not a method for weight loss but is instead a way to address specific areas of stubborn fat, also known as body contouring. However, many patients who want to lose weight find great success by reaching their goal weight first and then using liposuction to fine-tune the appearance they’ve worked so hard for. Myth: Liposuction Will Reduce Sagging Skin. Myth: I Will Have Noticeable Scars after Liposuction. Any surgery will leave a scar, but the scars from liposuction are particularly small and subtle. The incisions only need to be large enough for the tiny tube which removes the fat, so the incisions are very small and are strategically placed in areas that are as discreet as possible. Cellulite is the fat right below the surface of the skin. It typically looks bumpy and uneven because the fat pushes through the connective tissue. While many people think it is unattractive, cellulite doesn’t present any health concerns. It’s also not removed by liposuction, although the procedure might make your cellulite less visible. If it’s a concern for you, you can discuss options for reducing the look of cellulite with your doctor. Myth: Instant Six Pack Abs and Breast Reductions are Possible with Liposuction. To some extent, this is true but it’s important to manage your expectations. The less fat you have, the more likely you will achieve sculpted, six pack abs than patients with higher body fat (despite having more fat removed). Myth: The More Fat Removed, the Better. Actually, the more fat you remove, the higher the chances for risks you don’t want to deal with such as lumps and bumps. These fears are most likely driven by the fact that patients request aggressive treatment of localized fatty deposits. The more fat that is removed, the greater the potential risk of developing these problems. The American Society of Plastic Surgery recommends limiting liposuction to five liters (about 11 pounds) in an outpatient setting.